The golf-cart staging area at the TPC Sawgrass resort recieved a decorative concrete facelift — just in time to host the highest-paying championship in golf. Although most resurfacing jobs are done to cover something up, the concrete staging area at the Tournament Players Club Sawgrass was perfectly serviceable. It wasn’t cracked or spalling. It wasn’t even particularly ugly. But it was plain, and the TPC Sawgrass golf resort is anything but plain. The TPC Sawgrass, situated in Ponte Vedra Beach, Fla., is owned and operated by the PGA Tour, and it is the flagship of the TPC chain of golf resorts. Home to the Players Championship, the highest-paying tournament in golf, the TPC Sawgrass gets a lot of media attention around this time of year. Since the PGA Tour didn’t want an expanse of boring gray concrete to mar their flyover shots during the Championship coverage, they went to the Internet — and came up with Craig Heidinger. Before resurfacing, the golf-cart pickup area was not in bad shape, but it also wasn’t very attractive. Heidinger, owner of Concrete Options in Yulee, Fla., had a challenge before him. The space that needed a facelift was the 12,000-square-foot area where the golfers catch a lift out onto the green — a bit like valet parking, only with golf carts. Although the TPC has a pattern of 1-inch pavers that they use throughout the course, they couldn’t use them for the pickup area because the pavers wouldn’t stand up to the traffic. Heidinger’s job was to give them an overlay that was not only durable, but also matched the paver pattern — and he had a month to do it. So in January, in the weeks leading up to World of Concrete, Heidinger consulted with SureCrete, whose products make up 95 percent of the products he uses, on how they were going to match this pattern. David Morris, sales consultant for SureCrete Design Products, tried a number of stamp manufacturers to see if they’d be willing to make a custom stamp for them, but they dragged their feet. “They were too busy preparing for World of Concrete,” he says. But Julie Ellis, owner of Art Stamped Concrete, was ready to take on the challenge. After meeting up with Morris and Heidinger at World of Concrete, Ellis produced, in just three weeks, custom stamping mats that recreated the pattern and texture of the TPC pavers. So, with a truckful of custom mats and SureCrete products, Heidinger arrived at the TPC Sawgrass on Feb. 2, ready to give this top-of-the-line golf course a facelift. After filling the expansion joints with epoxy and giving the entire surface a good wash-down with a pressure sprayer, Heidinger was ready for the overlay. able to match a stamped overlay to an existing paver pattern used throughout the resort. Heidinger and his crew did the surface 1,000 square feet at a time, with 10 to 12 bags of SureStamp gauge-raked out to 1/4 inch. In an effort to help him with his fast-approaching deadline, SureCrete blended the pigment for the integral color in the bag before shipping, eliminating a step on the job site. Once the stampable overlay was down, it was time for the really tricky part. But despite the challenges of working with an unfamiliar, finicky stamping pattern, the next step of the process produced spectacular results. Using SureCrete’s water-based EcoStain, Heidinger custom-blended a variety of colors to use as his palette. Applying these in layers, he and his crew painstakingly hand-stained each individual rectangle to achieve the natural, varied look of the original pavers. 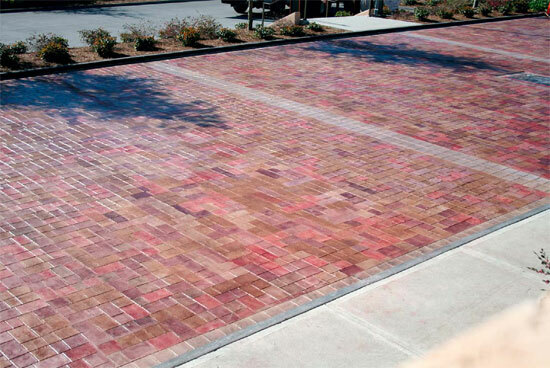 “The real magic of the job was [Heidinger’s] ability to match the colors,” says SureCrete’s Morris. Still, Heidinger was nervous, at first, because no matter how hard they tried, they couldn’t get it to look exactly the same as the original. But his fears were soon put to rest. Once the client saw what it was going to look like, Heidinger says, they loved it. And it’s a good thing, too — the coloring process took as long as the rest of the tasks put together. But there were challenges involved in working for such a high-profile client, as well. The TPC Sawgrass is not only busy during the Players Championship, but all year round — and no one was about to forgo his or her golf cart pickup just so the concrete could get a makeover. Thus, Heidinger and his crew had a constant audience. Heidinger says that on an average day there would be 200 people “stopping, looking, and gawking.” The gawkers were preferable to some of the other guests, who simply walked across the unfinished surface. Despite the constant scrutiny, though, Heidinger views the TPC job as a win-win situation. It was certainly a professional coup for him, and the PGA Tour’s flagship golf club has an exceptionally photogenic new home for its carts.